Liberate space-frogs and space-bunnies on the go! A co-op jewel of the last few years is making one of the least surprising moves possible. 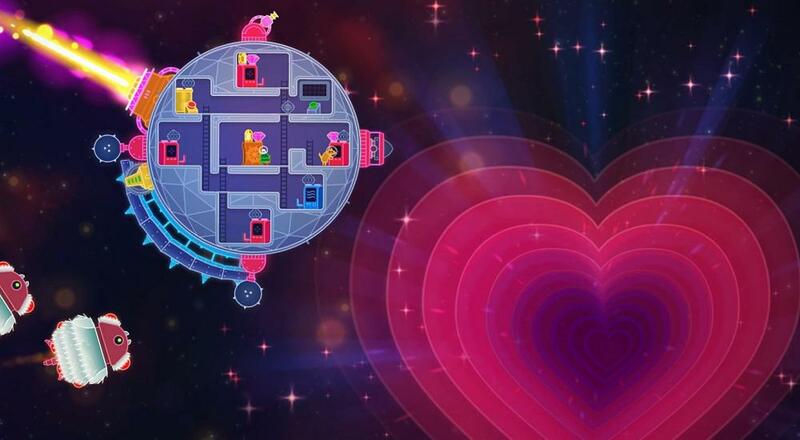 Asteroid Base's fantastic title, Lovers in a Dangerous Spacetime, will be available on the Nintendo Switch starting October 3rd. Looking back, this move probably seemed inevitable given Nintendo's current indie infatuation and Lovers' potential synergy with the console, but let's just take a moment and celebrate the fact that it's becoming a reality. I'll give you all some time to yourselves. Perfect. With that out of the way, how about we reacquaint ourselves a bit by watching the game's Switch trailer. Lovers originally released back in 2015 and featured local co-op for up to four players. In it, your group must work together to guide a ship through dangerous, semi-random environments in a quest to save various animals from their... space... prisons. For the sake of love. Listen, it's a little hard to encapsulate in a few sentences, so if you aren't familiar with the game, why don't you check out our review? Page created in 0.2965 seconds.